Okay, confession time – I have a bit of a soft spot for zombies! Maybe not ‘soft’ spot as that makes me think of brain matter, bone marrow and internal organs but I do like a spot of zombie action on the TV every now and then. I’m a huge fan of ‘The Walking Dead’ and ‘Survivors,’ a post-apocalyptic series, and I have also heard of another one that I must have completely missed when it was TV called ‘Dead Set.’ I was very excited to have been browsing in my lovely local Library last week when I came across a book called ‘Autumn’ which is labelled as being ‘The Hit Zombie Novel.’ I cannot believe that I never even thought of Googling books about zombies! I grabbed it fast and practically ran to my car so I could go home and make a start on it before the kiddiwinks came home! 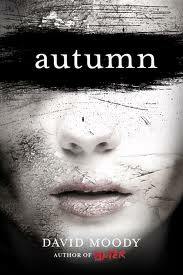 I read ‘Autumn’ in two days (kids be damned!) as I found it pretty hard to put down. The fact that it had really short chapters helped, and a lot seem to happen in most of them (gotta love that!) This book reminded me a lot of other TV shows I’ve seen but this book has been around a long time on the internet (the author couldn’t get it published so he had been giving it away as a free download off his website) and has now been published, finally. Another thing I really liked about this book – apart from the characters, who were very ‘real’, the drama and the tension – was the fact that it is set in the UK. A lot of zombie, vampire, ghost stories etc etc are set in America, and as much as I like reading those too, I always find it pretty special when I find a a good English one. Autumn has a sequel out already called ‘Autumn: The City.’ I can’t wait to get my hands on a copy of this and devour away again… Make room, Edward, Harry, Sookie and crew – you have some new ‘friends’ joining you on our bookshelves soon!